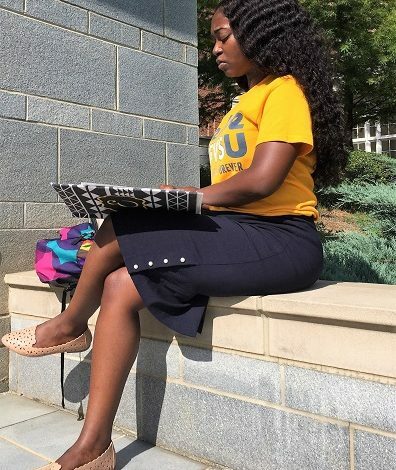 Returning this fall semester as a senior, Fort Valley State University Wildcat LaShombria Ellerbee is bringing with her a new set of skills and a new outlook on continuing her education. An agricultural economics major, the 21-year-old Albany, Georgia, native participated this past summer in the Emerging Scholars Internship program at the University of Georgia (UGA) in Athens. The Emerging Scholars Internship is an opportunity for students at FVSU and Florida A&M University (FAMU) to conduct research with UGA’s College of Agricultural and Environmental Sciences (CAES) professionals. This eight-week program targets students who are interested in research and planning to attend graduate school in agriculture and related sciences. Students receive hands-on research experience to better prepare for graduate studies. Originally considering starting her own business after earning her bachelor’s degree, Ellerbee said she shifted her attention to graduate school when learning about the internship during a visit with FVSU’s Emerging Leaders Interactive Training and Experience (ELITE) Program. She mentioned that Dr. Mohammed Ibrahim, FVSU agricultural economics professor, also encouraged her to apply. “At first, I was not sure about what I wanted to do after my first four years of college. I had a little interest in graduate school, so I decided to try it,” Ellerbee said. Excited to be one of two students selected for the internship, the FVSU senior received a monthly $1,500 stipend and worked with Dr. Levi Russell, UGA assistant professor of agricultural and applied economics. Her typical work schedule, 8 a.m. to 5 p.m. Monday through Friday, involved researching consumers’ willingness to pay for locally produced beef. She then summarized the information in an annotated bibliography. Ellerbee said her research efforts were not difficult, and she enjoyed Russell allowing her to work independently and guiding her through the project. As a result, she found that Caucasian female consumers who are mothers, over the age of 25, have a higher education and live in rural areas were most likely willing to pay for locally produced beef. At the conclusion of her internship, she prepared a scientific report of her research activities and presented her findings in a professional setting, with her family in attendance. As an Emerging Scholars participant, Ellerbee gained new skills and a desire to pursue a graduate degree in agricultural and applied economics at UGA. “The internship, research and professors influenced me in a major way,” she said. Ellerbee advises other students to apply for the program. “It is a great opportunity, especially the networking and research,” she said. The Emerging Scholars Internship is open to rising juniors and seniors from Historically Black Colleges and Universities (HBCUs) and 1890 Land-Grant Universities majoring in agriculture and related sciences. In addition, applicants must have an interest and ability to conduct and communicate scientific research, a strong interest in attending graduate school and a minimum 3.2 grade point average. For more information about the Emerging Scholars Internship, visit https://bit.ly/2O6UXeX.